Through all the cinema history we have seen all kind of unconventional policemen, many of them with Irish roots doing their job in America (remember as an example the unforgettable Sean Connery in The Untouchables). But not so many of these Irish characters are actually portrayed while working in their native Ireland. 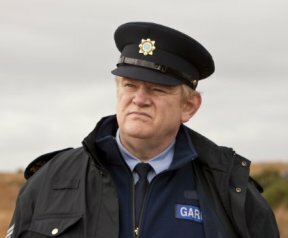 In that beautiful country is where director John Michael McDonagh sets up the action with a superb Brendan Gleeson as main character and soul of the movie. Don Cheadle teams up with him as the uptight FBI agent whose mission is to arrest a gang of dangerous Irish drug dealers, but it is undoubtedly Gleeson who gives some of the best moments in the film, with some exhilarating scenes like the dialogues with the IRA member when he goes to pick back the guns or one of the criminals who is waiting for him at his home to finish him. More than the average easy jokes with a tandem of white-black policemen, here what you find is a witty and subtle sense of humor, a very Irish way of making fun of themselves while at the same time standing proud of their country, language and traditions. Maybe it is not the mainstream entertainment that many spectators are looking for, and I would also criticize that a powerful actor like Mark Strong is pretty much wasted in his secondary role when it would have been delicious to see him with a few more minutes on screen, but all in all, The Guard is an intelligent movie and with quite funny moments when you scratch on the surface.